As a nod to the menu’s modern leanings, first-time restaurateurs and Seattleites Oliver and Gita Bangera have kept the exposed brick in the 1889 building (former home of Soup Daddy Soups) visible, adding bursts of gold for a bit of pizzazz and a large wooden communal table in the center of the 76-seat dining room. The Bangeras named the restaurant after executive chef and longtime friend Nirmal Monteiro, who has three decades of fine dining experience across India, Italy and in Tokyo. His most recent post was at a five-star hotel in Mumbai, and I think it is his global view that fuels the restaurant’s updated Indian food. His lunch thalis, vegetarian ($14) and meat ($16), are a great example: They might feature dishes from Kashmir, West Bengal, Goa or Kerala, or even a mash-up of those regions’ cuisines. 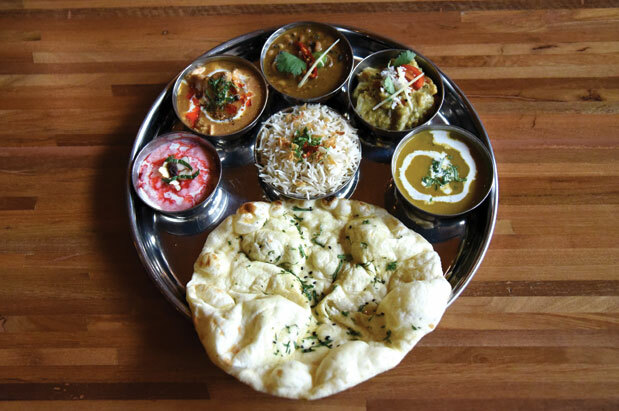 Thalis include a soup, a vegetable dish, meat curry, dal, dessert, rice and bread. I’m told Monteiro has 200 curries in his repertoire, so it’s possible you’ll never taste the same thali twice. His Goan curry ($19), a signature of that coastal state, is a must: seasonal fish fillets (in my case, wild Alaska salmon) simmered in a mixture of fresh coconut milk, tamarind and the bright red bedgi (byadgi) chile, native to Karnataka. You’ll want at least one order of whole wheat mint roti ($3) to lap up the sauce. If you’re curious about goat meat, Nirmal’s is the place to try it. Monteiro marinates the bone-in meat overnight in yogurt, caramelized onions, chili paste and ginger, and then roasts it for three hours with bay leaves, black cardamom and cinnamon for a spicy, surprisingly tender Punjabi goat rogni ($19). Lovers of tandoori chicken ($13) will relish how the pieces arrive piping hot and charred on the outside, moist and juicy on the inside.